The tension between the two camps is hardly surprising. On one side are those who believe that bitcoin and cryptocurrencies like it will fundamentally change the financial system by allowing individuals to exchange value digitally—without having to rely on authorities like banks and credit card companies to facilitate transactions or government agencies to oversee them. On the other are the people working in, or closely with, those same institutions, who are naturally less keen and more skeptical about the prospect of disintermediation. The fundamental disagreement between the two groups boils down to differing beliefs about the role and power of financial regulators. The skeptics believe that regulators will clamp down on bitcoin if it ever becomes a broadly accepted means of payment because the pseudonymity allowed by the currency makes it easier to evade laws and taxation. Just as importantly, they believe that such a ban would be effective. Bitcoin enthusiasts scoff at these notions with a mixture of the disdain for regulation common to many in the tech community (perhaps best exemplified by Uber’s regulatory-evasion business model) and a belief that, even if regulators wanted to regulate bitcoin, they couldn’t. In one sense, the enthusiasts are right: it is essentially impossible to shut down the bitcoin network without shutting down the internet. However, it’s also true that national regulators could prohibit the use of bitcoin in their own domestic economies (or at least the regulated part of those economies), if they chose to do so. If enough governments took this path, they would set off a vicious cycle in which the currency’s reputation deteriorates as opportunities for conducting legitimate transactions shrinks. And while there is no apparent link between the value of bitcoin and its use today (indeed, the currency’s price has skyrocketed despite the fact that, as of July 2017, only 3 of the 500 largest online merchants accepted it as a means of payment, down from five a year earlier), it seems reasonable that the currency’s diminished potential would lead to a sharp fall in its value. But here’s the catch: while national regulators can make it more difficult to use bitcoin domestically, they can’t eliminate it without solving the difficult collective action problem of getting all countries (or at least all countries tied to the international financial system) to ban it. Consider, for example, a scenario in which all countries ban the use of bitcoin except Japan, which recently became the first major economy to recognize it as legal tender. In this case, it would be easy enough for anyone in the world to exchange bitcoin holdings for yen and then exchange that yen into the currency of their choosing. As long as some gateways between national fiat currencies and bitcoin exist, the currency would survive. What does this mean for financial inclusion? Over the last several years, many fintech companies have touted the idea that bitcoin can help expand financial access by allowing people to bypass the costs and delays associated with traditional financial intermediaries. However, the financial inclusion community has been, for the most part, skeptical. Last month, I hosted a panel discussion aimed at unpacking this skepticism. The event featured Elizabeth Rossiello, CEO of BitPesa, a company that uses bitcoin to facilitate payments between African companies and the rest of the world, along with financial inclusion experts Greg Chen (Consultative Group to Assist the Poor), Andi Dervishi (International Finance Corporation), and Harish Natarajan (World Bank). Rossiello noted that using bitcoin as a bridge currency allows BitPesa to provide cross-border payment services that are significantly cheaper and quicker than those provided by traditional financial actors. Compared to most other bitcoin-based remitters (many of whom have failed), BitPesa has been remarkably successful: whereas two years ago, the company processed monthly transactions worth less than $50,000, today it clears $13 million a month. Yet, despite its success, BitPesa’s experience also illustrates how fintech companies remain at the mercy of financial regulators: the Central Bank of Kenya issued a warning about using bitcoin in December 2015 and more recently prohibited bitcoin-based companies from opening or using bank accounts with local banks. As a result, BitPesa can no longer serve clients in the country where it was first established. While the other panel members acknowledged the role cryptocurrencies could play in improving cross-border payments to countries on the margins of the global financial system, they were more skeptical about their potential to help meet financial inclusion goals like universal financial access. According to the Findex survey, the four most common reasons people give for not owning a transaction account are (1) lack of money and no need, (2) the cost of services, (3) physical distance from financial institutions, and (4) lack of appropriate identifying documents. While cryptocurrencies might help lower the cost of transactions in uncompetitive markets and solve for the problem of distance (at least where internet access exists), there is no reason to believe that they would do so more efficiently than mobile money solutions, which allow customers to send, receive, and store e-money on their phones. And mobile money platforms have the crucial advantage that they can be incorporated into existing regulatory and supervisory systems. Regardless of what stance national regulators ultimately take, it’s clear that bitcoin currently does not function well as a means of payment due to its high volatility, limited ability to scale (which increases transaction times and fees), and the amount of energy consumed by mining new bitcoins. 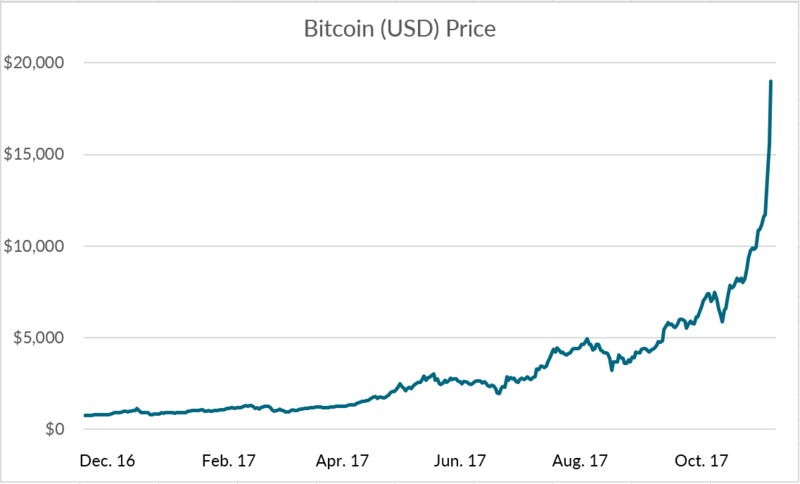 Bitcoin’s proponents argue that the currency’s volatility will diminish over time, as people begin to use it to spend rather than speculate (although who wants to spend a coin that may appreciate by 100 percent in a week?) and as traders take advantage of new instruments to short the currency. The scalability challenge also seems solvable, particularly after the Segwit2 fork that occurred in November expanded the size of blocks and opened the door to solutions like the Lightning Network, which could raise the network’s limit of transactions per second to the millions. Reducing the energy required to mine new bitcoins could be more difficult to solve, particularly if the price of the currency continues to climb. Although there is a high degree of uncertainty over estimates of bitcoin’s energy use, the trend troubling. It’s possible that the Bitcoin network could shift away from its energy-intensive proof-of-work consensus protocol to a more efficient proof-of-stake protocol (as Ethereum intends to do soon), but the security provided by the latter is unproven.